As you and your family step off the Mayflower, you tingle with excitement at the prospect of freedom. With this new land brings the challenge of survival. To succeed, you must build shelter, grow crops, and conduct trade with your neighbors. The winner of this game will be the one that achieves prosperity in â€¦ New England. What's brown and green and played all over? Hiding behind the earth tones. 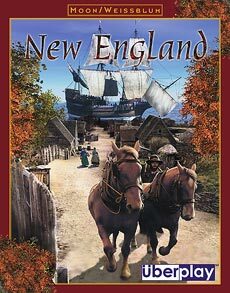 Alan Moon's New England is a very good strategy game. There's a lot of depth to the relatively short playing time. The rules are simple and very well laid out and the components are excellent. There is one thing that makes New England stand out from other "develop your territory to gain victory points"-games, and that is it's bidding mechanism. The way bidding is done, is both simple and effective - and it is excruciating to always have to assess how much you are willing to pay for the privilige of going first. The game flows well and provides a different feel than other games of this type - and the bidding mechanism makes it very easy to teach newcomers as well.